The Sindhi Society of Central Florida will hold the first Prana Pratishta in Florida of their patron God Sai Jhulay Laal on March 9-10. The Murti Staphna will be at Maa Durga Sri Saibaba Temple, 11414 S. Apopka Vineland Road, Orlando. All Hindus believe that there is one God but he has various names and worship many deities. Sindhis also believe the same and have their own deity Lord Jhulay Laal who is known as Uderolal, Lal Sai, Dool Halal, Zinda Pir, Khawaja Pir, etc. He is also worshiped as Ishta Dev, Varun Dev by the Hindus, who is the incarnation of Sri Krishna. Sri Krishna in the Gita says that whenever adharma (evil) tries to overcome dharma and injustice or unrighteousness on earth, he shall come as an avatar to rescue people. Some scholars believe that Rig Veda was written on the banks of river Sindhu. There also is a mention that in the mid-10th century AD, Lord Varun Dev took avatar in the form of Lord Jhulay Laal in Nasarpur province of Thatta Sindh (state of united India) now Pakistan, to save the Hindus from the tyrannous and fanatic Muslim ruler Mirkha Shah, who had taken a vow to convert all Sindhi Hindus. Hence, Jhulay Laal is known as the savior, saint, patron of all Hindu Sindhis. The previously published series on “Prana Pratishtha: Consecretion of Divine Energy in Hindu Deities” (published in 2018 December and 2019 January and February issues) discussed the significance and the process of the new Sanatan Mandir’s Prana Pratishtha Mahotsav, which will be part of the mandir’s grand celebration April 9-14. In this issue, our main premise is to describe gods and goddesses, who will be installed for the first time in Florida. Shree Jagannath (the Lord of the Universe): The all-mighty Lord along with his siblings, Balabhadra and Subhadra, are the prime deities of the temple of Puri. 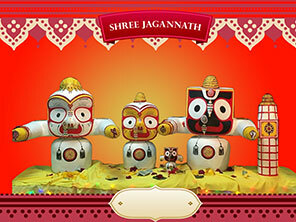 Originally, Jagannatha was worshipped as Nila Madhava by an aboriginal chief. Indradyumna, a king in central India as per divine direction, made him a public deity. Shree Jagannath’s arms are parallel, denoting His willingness to embrace devotees from all over the world and his eyes are round devoid of eyelids, signifying that He looks after the welfare of his devotees without any sleep. An integral ritual of the temple is the offering of “Chappan Bhog” (56 food items) to the Lord and serving of Mahaprashad (Lord’s offering) to the devotees. “Nabakalebara,” a religious ceremony that takes place in a gap of 12 to 19 years, is observed for the re-embodiment of the three deities when they relinquish their old bodies and assume a new one. Once a year, in June/July, Ratha-Yatra, the Festival of Chariots, is celebrated, when the three deities are taken out from the temple for a ritual procession. 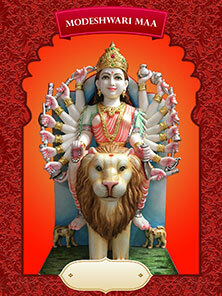 Modeshwari Mata is an aspect of the Goddess Durga. She is regarded as the ‘Kuldevi’ (family/clan deity) of the Modh community of Gujarat. Modeshwari is also regarded as the chief goddess of Gujarat and there are numerous temples dedicated to the goddess all over the state. A renowned temple dedicated to the goddess is located west of the town of Mehsana, 9 miles from Modhera. The legendary story behind the temple narrates about a demon Karnat who was savaging everything in the region. The saints of the region turned to Goddess Parvati and prayed for her divine intervention, and Modeshwari Mata was manifested to destroy the demon and bring peace to the region. 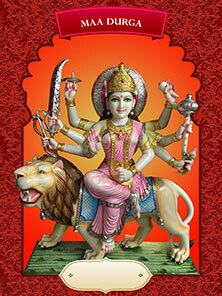 The sculpture of the goddess in the temple has 18 arms, each bearing a weapon representing a divine significance. Mata Vaishno Devi is believed to be an expression of collective spiritual powers of the three divine deities, namely, Maa Laxmi, Maa Saraswati and Maa Kaali. The original temple dedicated to the Devi is in the state of Jammu and Kashmir in India and is at an elevation of 5,300 feet above sea level on the Trikuta Hills of the lower Himalayas. The temple is housed in a cave, which enshrines the three holy deities in the form of three naturally formed stone mounds. As per the legends, the divine deity was born in the household of Ratnakar and was named Vaishnavi. By her sincere penance to Lord Rama, she was graced with his blessings and was endowed with divine power. Mata Vaishno Devi eventually resided in the holy cave to continue to guide in times of darkness and need. Devotees throng the temples of Mata Vaishno Devi to seek her blessings, especially, during Navratri festival (nine days long), observed twice in the year – March to April and again, September to November. Guru Dattatreya is a well-known saint mentioned in the Puranas. He is the son of great sage Atri Muni, and his wife Ansuiya Mata. The name “Dattatreya” is derived from two Sanskrit words, Datta (which means “given”) and Atreya (which refers to the sage “Atri”, his father). Guru Dattatreya is also referred to as a Hindu deity having the aspect of the Divine Trinity or Trimurti of Brahma, Vishnu, and Maheshwara. He is seen as having three heads that symbolize his identity as the Devas of the Trinity. Also, he is depicted as having six hands each holding an item that portrays a holy significance. Guru Dattatreya is regarded as a highly esteemed teacher of Yoga, with clear Tantric traits. Datta Jayanti, the celebration of Guru’s birthday is observed on the full moon day of Margashirsha month of the Hindu calendar. 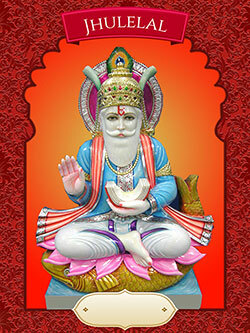 Jhulelal, meaning “the Lord of the Swing” is the prime deity (Ishta Dev) of the Sindhi community of India and Pakistan. He is believed to have been born during the 10th century A.D. in the province of Sindh (erstwhile known as the land of seven rivers). As per legends, the oppressed Hindus tired of the atrocities of the then Turkish ruler prayed to Lord Varuna (Lord of the River) incessantly for 40 days; thereby prompting Lord Jhulelal to commence as the incarnation of Lord Varuna to save the Sindh dwellers and bestow peace to them. Even today, Jhulelal continues to be the unifying force and the center of all cultural activities of the Sindhi community. When Sindhi men venture out to sea, womenfolk pray to him for their safe return by offering a traditional Sindhi offering. Folks in Sindhi community greet each other with the phrase, “Jhulelal Bera Hee Paar” (meaning Jhulelal will resolve all problems), thus signifying their immense faith and adoration for their community deity, Jhulelal. Jhulelal Jayanti (birthday of Jhulelal) is celebrated in the Hindu month of Chaitra and is also commemorated as the Sindhi New Year. Story provided by Dr. Shyam Mohapatra of Tampa and Nivedita Das of Sarasota. 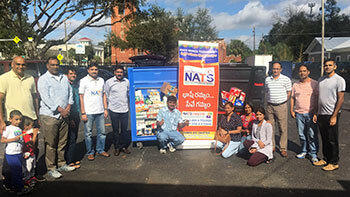 The Tampa Bay chapter of NATS (North America Telugu Society) recently collected about 2,000 cans of food for donation to Metropolitan Ministries of Tampa. Barely a year old, the Tampa chapter of the non-profit organization has conducted seminars on living will and trust, crime prevention and active shooter preparedness (Coffee with Cop), college preparation, health and life, as well as held a robotics workshop, volunteered for Habitat for Humanity, and participated in International Yoga Day. The Tampa regional North South Foundation contests will be held on April 6-7 at the University of South Florida, Cooper Hall, 2nd floor. Sponsored by Gurukulam of Tampa Bay Sunday School, the contests include spelling bee, vocabulary bee, math bee, science bee, geography bee, public speaking bee and Essay Writing. NorthSouth is a non-profit, volunteer-run organization founded in 1989 by Dr. Ratnam Chitturi with a goal to promote excellence by providing scholarships to meritorious but financially disadvantaged students. NorthSouth has instituted a scholarship program in India in more than 25 centers to select the students interested in pursuing higher education and careers in engineering, medical or polytechnic schools. So far cumulatively, more than 20,000 scholarships have been given. NorthSouth operates 92 regional chapters in the United States. The foundation has been conducting workshops, contests, and coaching for more than 27 years powered by well-educated volunteers. Monetization of volunteer sweat is the primary source for North-South funding including scholarship awards. In the past 11 years, the Scripps National Spelling Bee Champions were trained and grew up through the North South Foundation. Similarly, children trained by North-South have excelled in other national competitions including National Geography Bee, Math Olympiad, MathCounts, Science Bowl, and History Bee. NorthSouth believes that Bee competitions help children to improve their communication, leadership skills, and self-confidence, and to become better citizens of tomorrow.